Friday afternoons/evenings are unbeatable, am I right? You're finally done with the long week and the whole stretch of weekend is ahead of you. When I get home on Fridays, I like to turn on some music throughout the house and open the windows if it's nice. Maybe sit on the couch and catch up on blogs (like now), or maybe do a little cleaning. Either way, everything feels so leisurely! Tonight is supposed to be stormy, but Ryan and I have perfect plans (IMO): Indian takeout, red wine, and finally watching Django Unchained. YES! 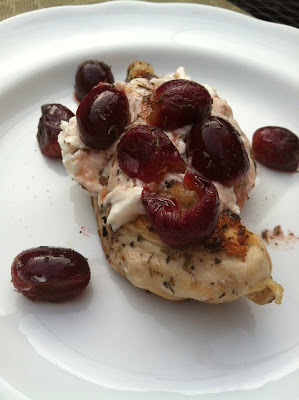 Before I put away the laptop and my phone for the night though (a habit I'm trying to increase), I had to share this FAN-FREAKING-TASTIC recipe for grilled chicken with goat cheese and thyme roasted grapes. I couldn't let you miss out on the opportunity to make it this weekend! It is out of this world. I had never roasted grapes before making this. I saw a recipe for a brushetta with ricotta and roasted grapes on Pinterest and the idea for this popped immediately into my head -- replace the bread with chicken and the ricotta with goat cheese! It seemed to be a perfect combination in my head, and the real thing came out even better. It's pretty easy to prepare too - ready in under 30 minutes! The chicken is prepared very similarly to my basic spiced chicken. For this recipe, I used thyme, basil, garlic powder, salt, and pepper. 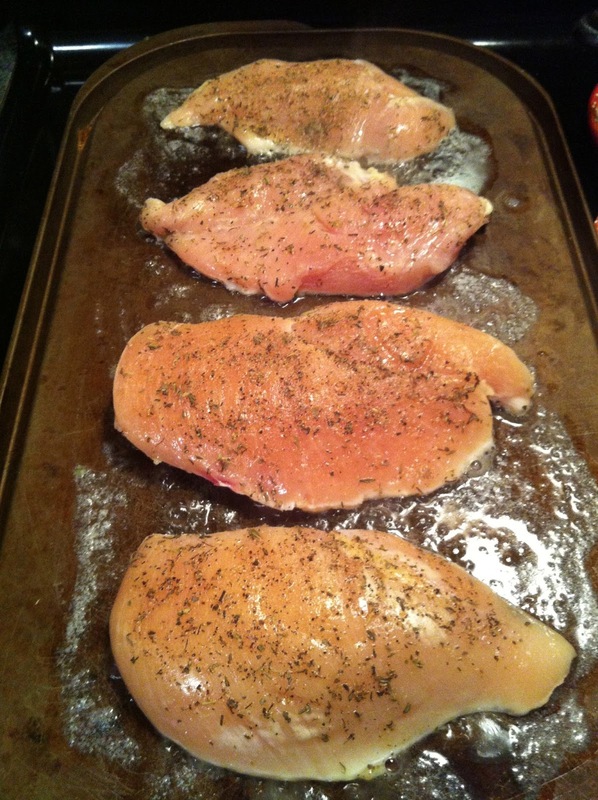 Rub the spice mixture all over 4 raw chicken breasts. Heat a griddle (pan would work fine too but do it in batches) over medium heat. Melt a tablespoon of butter and a tablespoon of olive oil, spreading to cover the pan. Add the chicken. This could also be done on an outdoor grill! Cook for 6-7 minutes per side, or until browned and cooked through. For the grapes, heat the oven to 450. Lay out a heaping cup of fresh, firm red grapes on a baking sheet. Cover with 1-2 tablespoons of olive oil, being sure to coat all of the grapes. Sprinkle with thyme. I used dried because it's what I had, but the addition of some fresh thyme would be great in this recipe! Roast the grapes for about 8-9 minutes, or until some of them begin to pop. Then, prepare your goat cheese mixture. Combine 1 oz of soft goat cheese with about 2 tablespoons of plain greek yogurt to make it a little creamier. If you'd like, add in a bit of dried thyme to this as well. To prepare: top each chicken breast with a quarter of the goat cheese mixture. Then, spoon on a scoop of those roasted grapes. 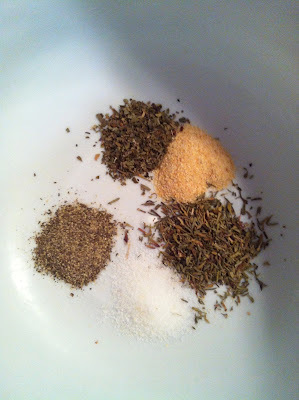 -Combine 1/2 tsp thyme, 1/4 tsp basil, 1/4 tsp garlic powder, 1/4 tsp salt, and 1/4 tsp pepper. 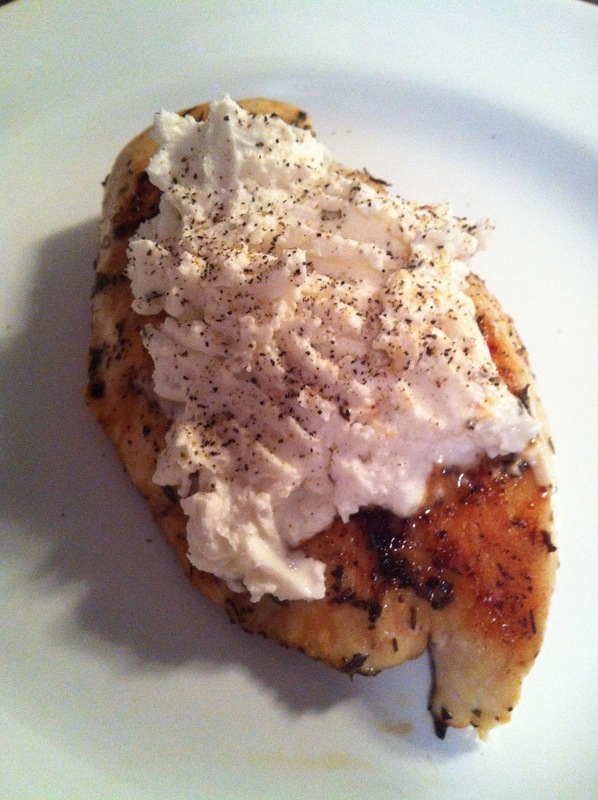 Rub all over both sides of chicken breasts. 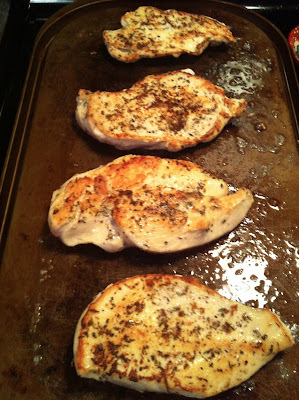 -Heat a griddle or saute pan (or use an outdoor grill!) over medium heat. Melt 1 tbsp butter and 1 tbsp olive oil, spreading to cover pan. 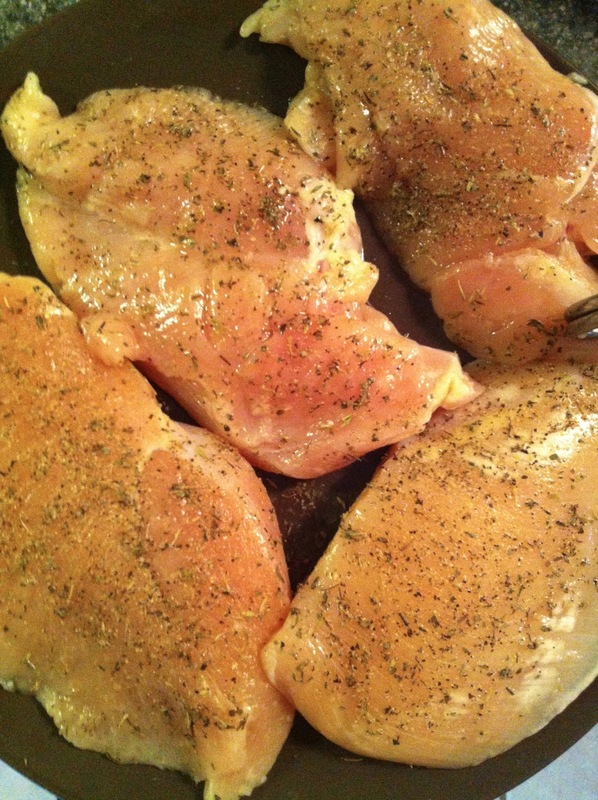 Add chicken and cook for 6-7 minutes per side, or until browned and cooked through. Transfer to a plate, tent with foil, and let rest 5-10 minutes. 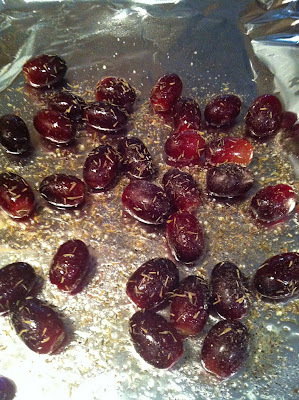 -Spread grapes out on a baking sheet. Toss with a tablespoon of two of olive oil. Top with 1/2 tsp thyme, sea salt and pepper. Roast in the oven for 8-9 minutes, or until some of the grapes start to pop. 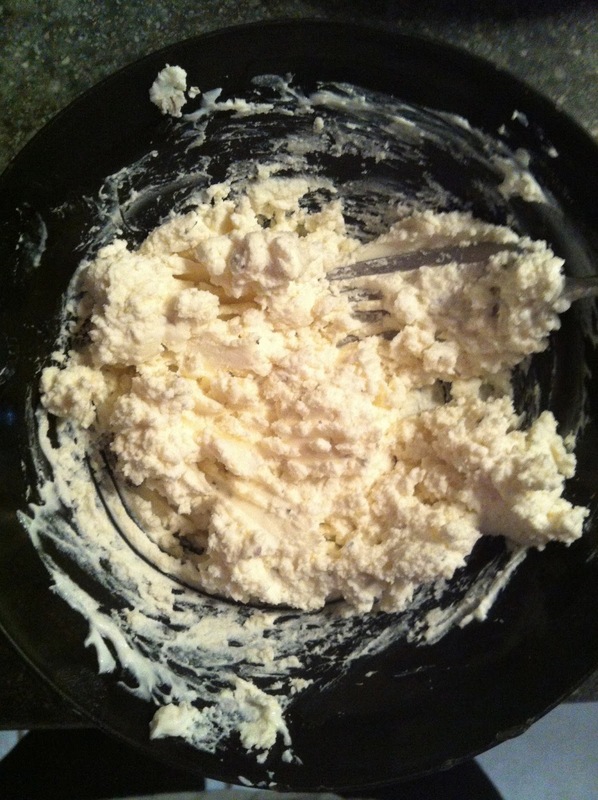 -Mix goat cheese with greek yogurt until creamy. If desired, add a pinch of thyme for additional flavor. -To serve: top each chicken breast with a quarter of the goat cheese mixture, then spoon on a quarter of the grapes. Hey cousin! This looks delicious! I will be making it. 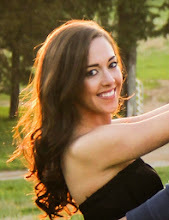 Currently doing the Blue Print Cleanse, but will be trying some of your recipes when I am done.